The event will focus on what we see as the five essential but intrinsically interlinked pillars of Intended Nationally Determined Contributions (INDC) implementation, informed by Ricardo Energy & Environment’s experience of supporting national climate policies and helping more than 15 countries develop their INDCs. 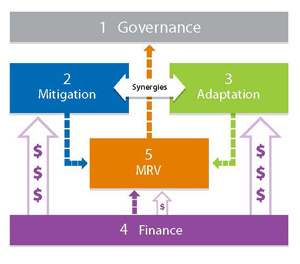 These pillars are: political will and effective governance; long-term mitigation strategies; integrated adaptation planning; climate finance frameworks; measurement, reporting and verification (MRV) systems. The event will kick-off with a presentation from Ricardo Energy & Environment which sets out these five pillars of INDC implementation, followed by speakers from the governments of developing countries, who will describe how they have approached the different pillars in their INDC development and plans for putting them into action. After the presentations will be a panel discussion, with the developing country governments joined by development partners who have been supporting INDC development.